Without clear information coming from the vestibular system, sights and sounds in the environment do not make sense – they are only isolated pieces of information disconnected from each other and from the meaningful whole. It is integration of sensory information that holds the key for finding meaning in the world. This two-day course will explore the connections of the vestibular-visual-auditory triad and their subsequent impact on function. Additionally, this course will provide participants with a precise template for intervention strategies, including administration of Astronaut Training. Occupational therapists, speech/language pathologists, physical therapists, educators, human services professionals, and other medical professionals. Graduating students or graduate students of the aforementioned fields are also welcome. Participants will receive a certification in the Astronaut Training Protocol. This course provides participants with the necessary background information to immediately begin incorporating Astronaut Training into their programs. Registration includes the handbook, Astronaut Training: A Sound Activated Vestibular-Visual Protocol for Moving, Looking and Listening and its companion CD (S&H fees may apply^). Test begins at approx. 4:05pm CST on day two. List the connections between the vestibular, auditory and visual systems. 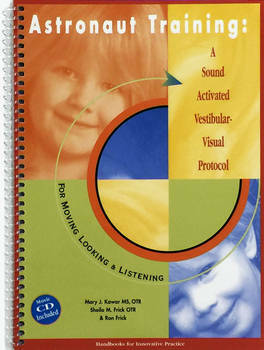 Recognize the reciprocal interaction between the Vestibular-Auditory-Visual Triad and the core postural muscles. Underline the importance of providing precise input to each of the five vestibular receptors. Identify powerful new tools to expand your clinical skills, including specific activities to develop and enhance core function. Select when to administer the Astronaut Training: A Sound Activated Vestibular-Visual Protocol safely and effectively.